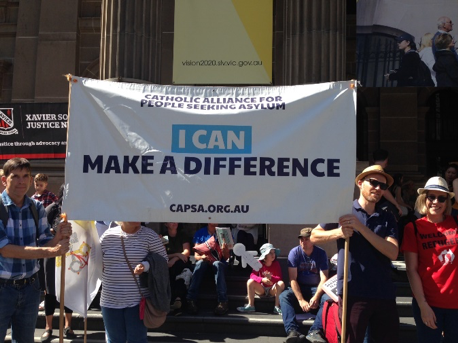 CAPSA is recruiting for an inspirational, passionate and dedicated Project Coordinator to join the team and unite the Catholic voice for a more humane and compassionate response to refugees and people seeking asylum. Please feel free to apply (see details below) and spread the word amongst your networks! Applications close 5.00pm on Wednesday 25 April 2018. The 2018 Walk For Justice For Refugees took place throughout Australia on Palm Sunday (25 March). People from all faith groups, community organisations and the general public joined the Palm Sunday Walk, bringing banners and other messages of support in solidarity with refugees and people seeking asylum. Thousands of people, including those representing the Catholic Alliance for People Seeking Asylum, attended the Walk. It’s important that we keep up this momentum to demonstrate the growing concern across the community about the harsh and punitive treatment of refugees and asylum seekers. On 31 January 2018 UNHCR released the Zero Draft of the Global Compact on Refugees. This Compact represents a long-awaited re-assessment of the ways in which States can fairly share their responsibilities to refugees. the importance of cooperation between States in ensuring that refugees are protected and long-term solutions achieved. You are warmly invited to attend a Words That Work Community Action Workshop, hosted by the Asylum Seeker Resource Centre, on Saturday 21 April in Carina, Brisbane. The Queensland ASRC team is working across the state to change the way we talk about the rights of people seeking asylum. Workshops are for anyone who want to help achieve lasting change in community attitudes, providing tools for how to speak positively and effectively, based on ground-breaking research. meet like-minded people who want to make a positive difference! Event hosted by the Asylum Seeker Resource Centre and supported by Our Lady of Graces Carina Parish Social Justice Group.